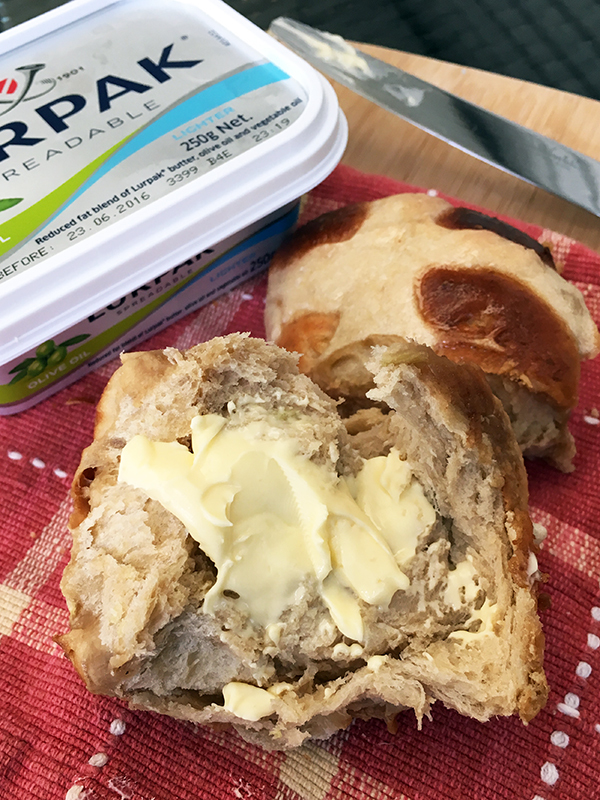 So we’re at Easter time again although you’d be forgiven for thinking that Easter falls in February with the appearance of Hot Cross Buns at Coles, even before Australia Day (January 26, for my non-Aussie readers). I do my best to avoid buns for as long as possible but by March, I can’t deny the convenience of throwing them at my family for anything from breakfast to a late evening snack. 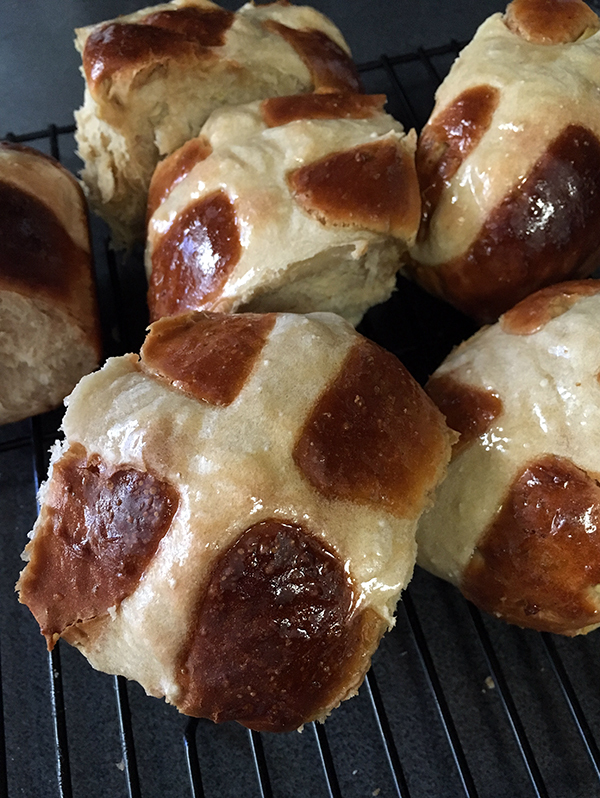 Usually, a week before Easter, I come up with special flavoured Hot Cross Buns (think Green Tea and Adzuki Bean). 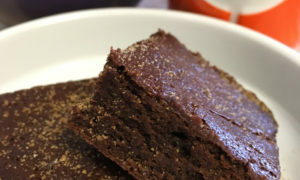 I think I may have missed a few Easters but this year, I was determined to bake a batch featuring my current flavour muse: Masala Chai. I mentioned in my last post that I had some minor surgery in February. While the surgery wasn’t serious, I still wanted to make sure I did everything good dietary-wise to ensure a speedy recovery. For the first time ever, I consistently drank water and kicked my daily coffee habit in favour of chai lattes and matcha based drinks. In adopting chai as my beverage of choice, I swiftly discovered that the spiced tea experience varies wildly from cafe to cafe. Cafes boasting award-winning baristas and the best house-roasted coffee beans do not necessarily a great chai latte make. The best chai drinks have generally come from places that favour soy over dairy and are more hippy than hipster. I think the bean focussed establishments tend to reach for the powdered chai latte to satisfy their leaf-favouring minority. You don’t have to blitz your masala chai ingredients before brewing but it does release more flavour I feel. I personally don’t mind chai latte mixes although some are certainly better than others (I do like my Bondi Chai Vanilla & Honey mix). However, if you have some spare time, it’s worth concocting your own blend from scratch and brewing up your own tea. 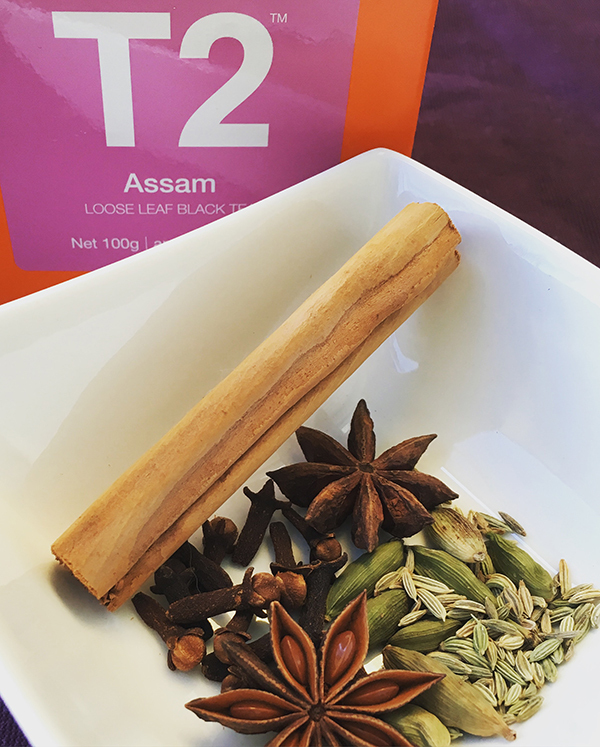 Much like making your own curry paste, creating your own bespoke Masala Chai is something everyone should try before assuming the Nescafe sachets are what chai lattes are all about. 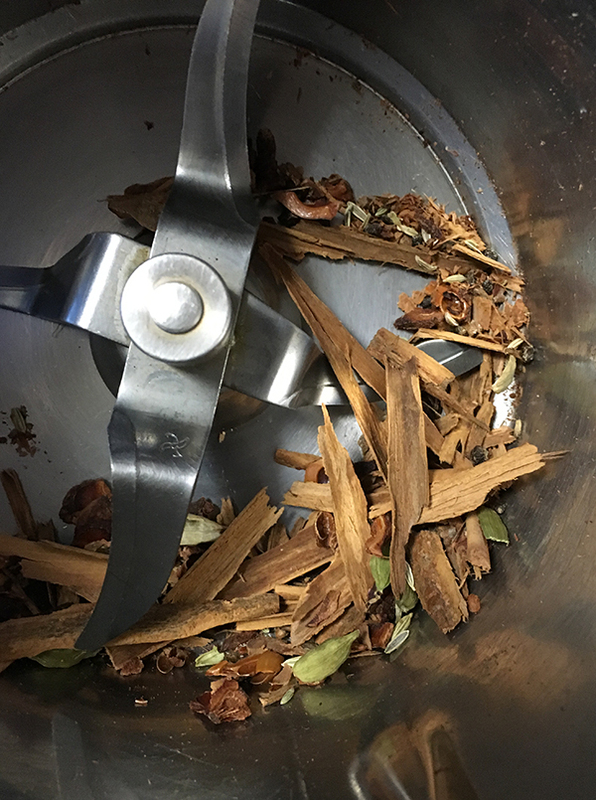 It’s a shame to write off chai just because one blend was cinnamon heavy, when in fact you can pick and choose your spices as desired. A fantastic write-up about Masala Chai can be found at The Kitchn, so I won’t try and espouse my relatively novice opinions about it. I’ll just share quickly that the only ingredients that must be included for Masala Chai are tea, cardamom, ginger, sugar and milk. Nope, no cinnamon, although it’s commonly included. As I do enjoy the flavour of cardamom, I decided to double the amount used. Other items I included were cinnamon, star anise, cloves, fennel seeds and fresh ginger. Black peppercorns are loved by some but I feel ginger gives the tea enough of a kick. 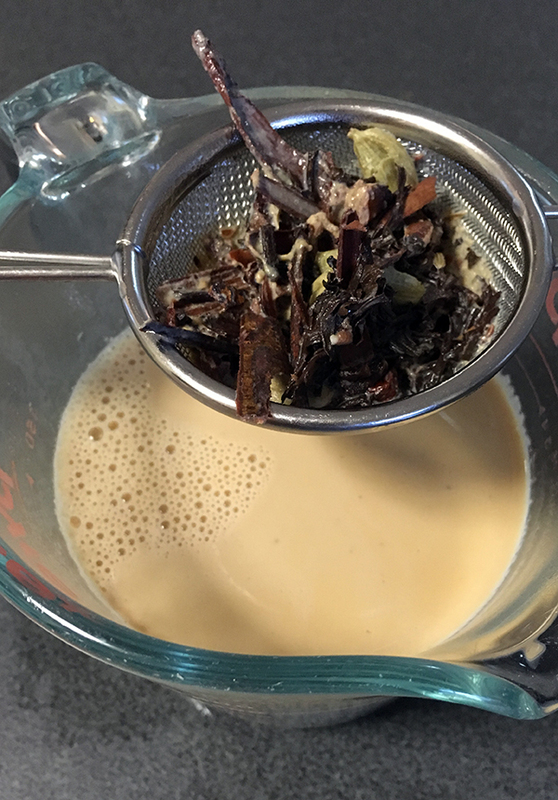 You can follow this recipe for Masala Chai Tea but I simply brewed all my preferred chai ingredients (with twice the tea than usual for extra flavour) in the Thermomix on 80C, Speed Soft for 10 minutes with 400g of milk. I set aside enough for the hot cross buns (and soaked my diced apple in it while hot) and a small cuppa for myself. Brew masala chai tea with milk as per your preferred method. Add diced apple to hot milk tea and allow to cool to room temperature. Combine flour, sugar and yeast and salt in TMX bowl (or stand mixer bowl). In a separate bowl, add egg and butter to cooled chai milk tea and whisk. Add milk mixture to flour and use dough hook to knead for 5 minutes or the Thermomix dough function for 3 minutes. Transfer dough to a large bowl. Cover bowl with plastic wrap and stand in a warm place for 40 minutes or until doubled in size. You can elect at this point to put the dough in fridge overnight for a morning bake (remove dough from fridge at least 20 minutes before following step). If baking immediately, knock back dough and cut into 6 equal pieces. Knead each piece into a ball, place in a lightly greased 22cm-square cake pan, cover with a damp tea towel and stand in a warm place for 40 minutes or until doubled in size. While buns are rising, preheat oven to 200C/420F (fan-forced). Combine ¼ cup flour and 2 tbsp water and stir to a smooth paste. 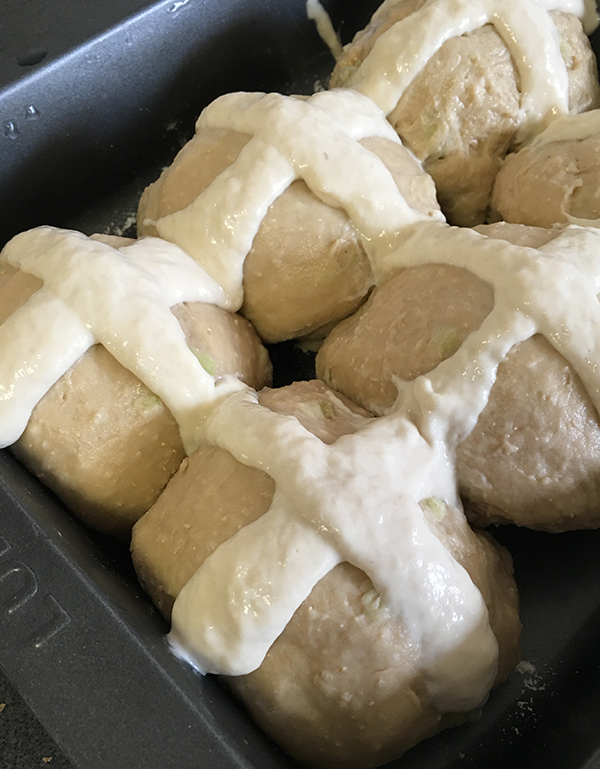 Once buns have risen, spoon flour paste into a piping bag fitted with a fine nozzle and pipe lines down each row to form crosses. Bake for 10 minutes, then reduce temperature to 200C and bake for another 10 minutes or until golden. (They’re ready when they sound hollow when tapped). Once out of oven, use a pastry brush to glaze buns with chai tea syrup (1/2 teaspoon of desired chai ingredients + tea boiled with ½ cup water and ½ brown sugar).